As a kid in the 1960s, The Green Hornet was one of this bloggers favorite television shows. The reason wasn't the character of Britt Reid / The Green Hornet, or Kato, played by Bruce Lee. It was because of the car: The Black Beauty. 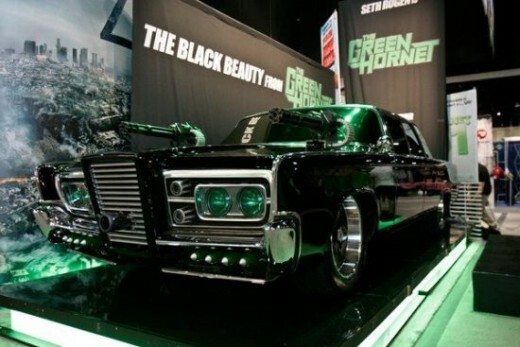 A cool, lethal vehicle that plays a starring role in the 2011 big screen remake The Green Hornet. If the recently released trailer is a decent representation of what to expect from the film, it's going to be a hit, and The Black Beauty will be its star. While the movie is obviously set in modern America, what remains as the connection to its 1960s TV past is the Chrysler Imperial that is converted to become The Black Beauty. It's a car that Chrysler should make for purchase today (without the machine guns, of course); it would turn around that car maker's fortunes overnight. As was the case when a kid, I'll see The Green Hornet for the car first, then for Cameron Diaz.